Today's plan: go shopping at half eight then start down the Stone locks, arriving at Aston Marina after the office opened at ten. Almost all of this was successful, I'm pleased to say. Admittedly, we didn't find another throw toy for Sally. The hardware store here had previously supplied one of her favourites, a mini tyre tire (it's American), but which we finally had to throw away as she'd managed to chew it up too much. They didn't have anything like that today, so it's back to the internet, I guess. We worked down Stone, meeting several boats on the way, including one rather disgruntled one. They'd planned to get a pump out at Stone Boat Building, but that's not available on a Monday, so were now having to go all the way to Etruria for one. I'm not sure I wouldn't have reversed back to the wide bit above Yard Lock, winded and gone to Aston, rather than thrash all the way up Stoke with legs crossed. Aston Marina was a salutary experience; gosh, we're glad we're in Mercia. Given that the whole thing was dug out to order, why on earth have they made such a pig's ear of the layout? Never mind that entrance is a pain for a full length boat, almost all new marina entrances are. There's nowhere to moor near the office and in order to use the pump out you have to tie with the boat in the mid-marina bridge hole. Where there is a paucity of mooring rings. I then trekked back to the office, several minutes walk, and paid the usual £15 for a token – it's a DIY pump out. I got back just as Sheila finished sorting out the pipe work. Final irritation: there's no pause button on the machine, so rinsing is a bit hit and miss. Mind you, the pump is decently powerful and ran long enough to empty our very full tank. Once it was pulling mostly air we turned on the water hose and ran water through the tank, rocking merrily all the while. It's left us with a tank about as empty as Andy achieves at the Trading Post by rinsing with watering cans full of cut water. It was handy to use today after being let down by Black Prince the other day, but I'd rather carry on to Great Haywood another time. By the time we'd finished it was nearly lunchtime, so we left the marina and tied on the towpath just beyond. The afternoon has been spent catching up with IT jobs, mainly. 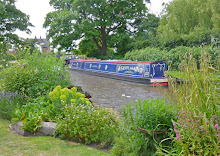 Tomorrow, a fairly long run to Tixall for the night and a chance to get some nice veg from the Farm Shop. Maybe there should be a BOG pump out rating system! It sounds as though Aston would manage only about three stars -- whereas Lee Valley Boats at Broxbourne the other day would certainly get five stars -- proper done for you pump out, loads of rinsing, and only £12.